In Harlem, a young Wall Streeter renovated a delapidated brownstone just blocks from where her grandmother once lived. The center of the house is crowned by an oculus inspired by traditional skylights from the Victorian era—one of the home's many mixes of modern and historic design. In Montreal, a pair of designers happily took on the challenge of building their dream home in a transitioning Montreal neighborhood. Working with a relatively small footprint that gave them just 1,100 total square feet of finished living space, the couple used simple and minimal materials to embrace and celebrate the original character of the 1880 home. In East Boston, a young architect transformed a small row house into a deceptively roomy family home. He renovated the entire home from top to bottom to give it an open, contemporary aesthetic that complements the historical character of the neighborhood. The dark, narrow walls so common to row houses were knocked down to create a warm, airy expanse that maximizes every inch. 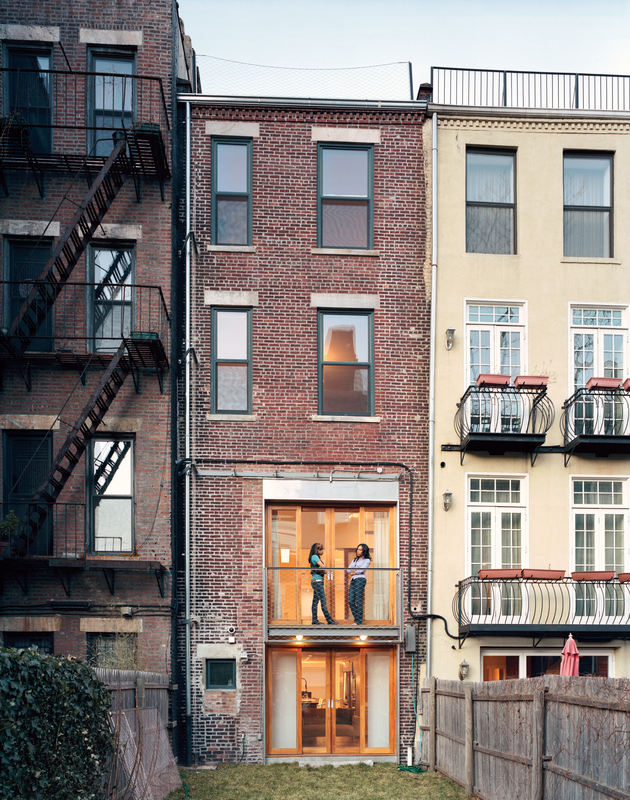 In Washington, D.C., an artistic couple envisioned a traditional row home as a blank canvas. The homeowners regularly entertain and they asked for a dining table that could accommodate dinner parties—especially ones that could easily move outdoors. The architect designed two matching tables and benches on either side of the sliding glass partition. With some clever renovations, what was once an innefficient row house became the city's first Passive House. While the proportions of the old brownstone’s facade remain congruous with others on its street, the stone has been replaced with stucco over foam. When knocked, it sounds entirely hollow.